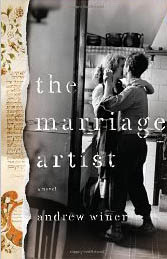 The Marriage Artist: A novel, by Andrew Winer, is an incredible literary feat, in my opinion. The novel is a a brilliantly composed saga of two stories that alternate within the pages. It is a book with broad and deep expanses, beginning in current times, and sweeping back to Vienna, beginning in 1928. The stories blend magically, with the magnificent word-imagery of Winer. In the present, we have Daniel Lichtmann, a well-respected art critic. His positive, stunning and admiring critiques of the native American, Blackfoot sculptor, Benjamin Wind, has made him (Wind) famous. The novel opens with the bodies of Wind and Lichtmann’s wife laying on the sidewalk in front of a New York City apartment building. By all accounts, it looks as if they plunged from the terrace. From there, the suspense begins, as the reader is taken on a trip through time, as Lichtmann tries to discover whether his wife was having an affair with Wind, whether they committed suicide together, or somehow fell off the terrace. Daniel is committed to uncovering what actually led up to the tragic event. Through is efforts, he uncovers information regarding his wife, information he didn’t know. He also uncovers information regarding Wind, his background and his artwork, and how is own critique of Wind’s last exhibit may have been far-fetched. The next chapter begins in 1928, a time of uproar and persecution towards the Jews, with ten-year old Josef Pick, as he visits his grandfather, in the less than desirable Jewish section of Vienna. The Pick family has converted to Catholicism in order to avoid the repercussions of being labeled Jewish. While there Josef becomes enthralled with his grandfather’s business of creating ketubot (prenuptial marriage contracts) for those who are looking to have a creative and ceremonial document of the groom’s rights and responsibilities concerning the bride. Josef’s father is with him, and watches as his son tries to create a ketubah of his own. The final result is one that brings awe to his grandfather Pommeranz, and causes Pommeranz to use Josef’s talent to earn extra money for his own needs. What transpires after that is nothing short of incredible, as the reader is taken on Josef’s journey of artistic development and creation with his amazing talent, one that brings him recognition in the world of art. Winer infuses the pages with the defining imagery, defining moments of the ravages of war. The journey continues through Josef’s adult life, through the days of the Holocaust and the antisemitism geared at the Jews. The story line had me thinking about the title, and alternate meanings. Aside from a ketubah, a marriage artist could be one who is creative in their own lives, one who tries to manipulate their marriage. After all, an artist is not just one who paints, draws, creates beautiful documents or etches on paper. An artist can be defined as so much more than that in the realm of daily life. The Marriage Artist moves forward and moves backward in the time continuum, and in history’s darkest hours. I was engulfed in the book, and could not put it down. I read it straight through, except for small breaks to eat, etc. I was mesmerized and absorbed with Winer’s use of beautiful and sensitive language. It was so beautiful that I was in awe of his prose. There were moments that I was emotionally caught up in the folds of the story. Andrew Winer is masterful at telling the tale of The Marriage Artist and blending families together. It is a lovely, sensitive and poignant story, one filled with the affects of assimilation, love and loss, and effects of lives caught in the maelstrom of evil, leading to an epiphany towards redemption. The novel is one of educational and historical worthiness. The drama and the intensity that is displayed is something that I feel should not be missed. I highly recommend The Marriage Artist to everyone. Here is a link to an online book seller, in which you can see many links to books on America’s Thanksgiving celebration. There are links for adults, teens and children. I am not promoting the book sellers, but promoting the reading of books relating to the holiday, for those that need to know more or want to educate themselves a bit more. Here is another link to more Thanksgiving books. Here is a link to some Thanksgiving novels. For those of you who celebrate Thanksgiving in the United States, I wish you a happy day, filled with kindness, love, humility, compassion, good conversations, good drinks and delicious food. Enjoy! Mary Antin, in my opinion, was a author ahead of her time in the early 20th century. Her memoir, The Promised Land, will be released again, 100 years after its first publication in 1912. I have a 1987 hard back book of The Promised Land, and might just order the new paperback release to add to my collection. I was lucky to get the 1987 copy as a free giveaway from my local library. I just began reading it, and am fascinated with each sentence. Like all authors who I find intriguing and fascinating, I like to collect their works, including newer releases of them, even if I have an older edition. This also include Salman Rushdie. I am in the midst of reading his memoir, Joseph Anton. I am enthralled. I am an avid reader of his books, and own all of them. What an author, what stunning writing, what a life he has led. I am about one third through the memoir and can’t put it down. His writing encompasses boundaries, and often opens boundaries of religion, social acceptance, assimilation and the immigrant experience. 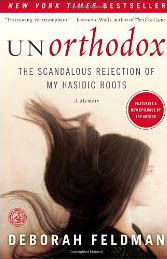 Unorthodox: The Scandalous Rejection of My Hasidic Roots, by Deborah Feldman, is an interesting study on the Satmar Hasidic community, and its all-encompassing grasp on those within its foundation. Feldman writes from her heart, that is clear, but also writes from a childhood perspective, in my opinion. Much of the book is written about her childhood, and the reader doesn’t really see much insight from that point of view. What we do see is a child who rebels against her religion and its standards and adherences. She constantly equates varied commands and foundations with religious hypocrisy, and is constantly questioning the edicts forced on the followers within the Satmar world. What we see is a restrictive environment, one filled with darkness, whereas other Hasidic sects are more apt to be filled with a richer and more happy foundation. The reader also sees a child who disagrees with much of the repressive demands of the Satmar community. When Feldman marries at the age of 17, she brings much of her innocence and childhood thoughts and feelings with her, which encompass the pages. We read of her disillusionment and her unsatisfying life with the Satmar environment. We are told of her feelings of repression and dissatisfaction. Marriage was an end result for the women, and a means to an end, so to speak. Marriage did not offer her any freedom, according to her, and it only fostered her feelings of forced subjection. She felt confined, unable to make her own choices and decisions. The males of her world were the ones in control, the ones who were the dominant force. The ultra strict laws and restrictions were enforced by them. There are some disturbing aspects within the pages, including the murder of a son by his father. Accordingly, it appears, that it was kept secret and the father did not arrested for his actions. Whether this is true, or an exaggerated incident, or whether it is not entirely clear from the eyes of a child, the reader is not sure. There is little content written from a mature perspective. How could there be, as Feldman was a child trapped in a woman’s body as she went through her teenage years. She had no knowledge of what was outside her confined and restrained world until she gained employment teaching. This is what caused her to see outside the boundaries of her Satmar life. There is little written which describes how Feldman actually left her husband, and how she seemingly gained custody of her young son (the reader doesn’t know for sure that she has legal custody). The “scandalous” factor, in the title, leaves me unfulfilled. The reader, in my opinion, does not read of scandal, of how her actions affected those around her, or of how the Satmar community reacted to her leaving. We are more or less told it was scandalous, but there are no details to support that in the memoir. There is nothing written in depth about her moving away, nothing supportive with concrete facts. We are given a brief glimpse of her leaving, a few pages detailing her move from the communal hold. It is almost as if Feldman was coming to the end of her story, and didn’t know how to finish it, so she filled in a few pages to complete the memoir. Feldman depicts a world of repressed women, a world where the outside society clashes with the Satmar community in every aspect. She demonstrates, from her young perspective, the harshness and strictness of daily life. It is an eye-opener in that respect. The cultural implications are strong. Readers of every religion can gain some insight into the cultural dimensions of the Satmar community. In fact, readers of any religion, or nonreligious individuals will learn of the practices and ideals of the Satmar world. And, they might even compare it to their own world, and not only see the differences, but also a similarity or two. Overall, I think Unorthodox: The Scandalous Rejection of My Hasidic Roots, by Deborah Feldman will appeal to young Hasidic women, and feel that they might be able to relate to, and identify with, some of Feldman’s issues and life experiences in today’s modern world. Audrey: The 60s is a new book I found in the biography section of the books store. It is a lovely book, filled with beautiful photographs and with wonderful quips regarding Audrey Hepburn. I am definitely going to buy it. The End of Your Life Book Club, by Will Schwalbe, is a book that I have ordered in e-form. It looked to be very poignant and inspirational. In Sunlight and in Shadow, by Mark Helprin, looks to be a book that I would enjoy. I will order it soon. Jews and Words, by Amos Oz and Fania Oz-Salberger, is a book that will definitely buy. I am an avid Amos Oz fan. Today marks the 74th anniversary of Kristallnacht, also known as the Night of Broken Glass. It was a horrific moment in time as Jews were discriminated against by Nazi storm troopers, their businesses and homes destroyed, their lives lost, and the survivors rounded up and sent to Nazi camps. 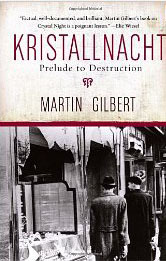 If you are seeking an in depth and compelling book to read about Kristallnacht, I highly recommend Sir Martin Gilbert’s Kristallnacht: Prelude to Destruction (Making History). It is an intense and deeply researched study of Kristallnacht, as only Sir Martin Gilbert can bring us. His brilliance in depicting the horrific moments of the event are written with masterfulness and directness. He leaves no stone unturned. I have this book in my own library, and refer to it often. City of Women, by David R. Gillham, is an incredible book, and a compelling look into the underlying forces that ordinary citizens, mainly women, in Berlin chose to implement during World War II. During World War II, Berlin, normally a city with a large population, had mainly women within its city walls, due to the fact most of the men were off to war. The women that remain, and what many of them eventually take on, turns the pages of this novel into an intense story. Sigrid is one of those women left in Berlin, and she not only masquerades her daily life and its journeys, but also has an affair with a Jewish man. Eventually, due to her decisions, she must reconcile her life as a wife with her life as a lover. She must combine and coordinate her daily life and its goings on that are expected of her, with her pursuit to help Jews. While the Berlin residents do almost anything to avoid interacting with the Gestapo, Sigrid lives with her mother-in-law, and her husband is off to war. Her love of movies brings her a chance encounter with her soon to be Jewish lover. The movie theater also bring her to meet a woman who calls on her to help in the hiding of Jews in the underground movement. City of Women is a page-turner, and once I began it, I read it straight through. It is a metaphor for the strength of women, and the heroics that some German women displayed during the extreme horrific and the tumultuous of times. City of Women is a book of love and war, good and evil, of soul searching, of decisive actions, and of redemption. I highly recommend City of Women, by David R. Gillham to everyone.